Where did you watch A Christmas Story, for the first time? My eighth grade science teacher brought it to class one day around Christmas time and I was hooked. Since then, it has been a family tradition to watch it on Christmas eve. We've never missed a beat. My son is 3 years old and he loves this movie, he decided to watch it a little early this year. This year, I can't wait to watch it a little differently. You can too! 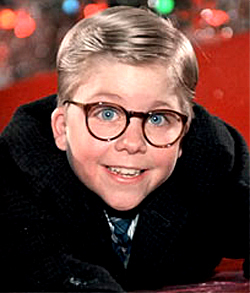 LaLa Music Fest presents a very special screening of A Christmas Story in San Fernando Valley. Hosted by Ellen K of KOST 103.5, enjoy the screening with members of the original cast in the beautiful Valley Performing Arts Center. For a limited time regular tickets are 50% off or get the VIP experience when you purchase Meet-N-Greet tickets and meet members of the cast and snag an autograph. A portion of ticket sales benefit Valley Relics Museum and CSUN Alumni Scholarship Association, as if you need more reasons to go. Spread the word, gift some tickets for yourself and your bestie and come enjoy the ultimate Christmas movie screening. Hope to see you there!